Looking for the best iPad 2 data tariff? Look no further - we're collating details on the iPad 2 data deals from the major UK networks as we get them. Orange is offering its customers the iPad 2 3G for £199 if you sign up for a two-year contract. The offer is for the 16GB 3G iPad 2, and the £25 per month data package consists of 1GB of anytime data plus another 1GB of data from midnight to 4pm. Like Orange, Vodafone is to sell the new Apple iPad 2 to its existing customers for £199, again for those willing to sign up to a two-year deal. The £199 offer is for the 16GB 3G iPad 2, with customers paying a monthly subscription of £24.50. Data-wise, this package consists of a monthly data allowance of 2GB, plus 1GB of Wi-Fi access through BT OpenZone. Additional data is charged at £15 per GB. 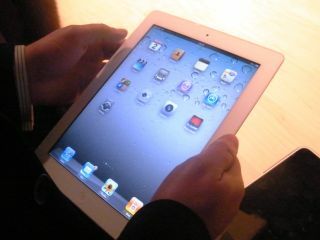 For new customers the iPad 2 price is £229 for the 16GB 3G model with a monthly tariff of £27. Full Vodafone iPad tariffs as shown above can be found on the Vodafone site. T-Mobile has announced its subsidised iPad 2 pricing - stating that you'll be able to pick up the next-gen Apple device for £199 if you're already a customer of the network. If you're signing up as a new customer, the price goes up to £229. For that, you'll be getting the 16GB iPad 2, and you'll be signing up for a two-year data plan which is £25 a month for existing T-Mobilers and £2 more for new customers. This buys you 1GB of data a month, plus 1GB to use in T-Mobile's declared "quiet time" of 12am - 10am. So, as an existing customer your total outlay over the two years would be £799 and as a new member of the T-Mobile club, it would be £877. Customers can also add 500MB of data as a one-off amount if they are within a recurring data plan. Three is selling the iPad 2 at 45 selected Three Stores. For existing customers, the 16GB 3G iPad 2 has an up-front cost of £199 while the 32GB model is £249. The 64GB iPad 2 is £349 for existing customers. If you are a new customer, the 16GB 3G iPad 2 will set you back £229 plus £25 a month on a 24-month contract. The tariff includes 15GB of data per month. The 32GB 3G iPad 2 is £279 up front, while the 64GB 3G iPad 2 is £379. Again, these are on 24-month contracts at £25 a month with a data allowance of 15GB per month. You can check out Three's complete pricing on its iPad 2 page. Those compare to prices last year respectively of £429, £499, £599, £529, £599 and £699. Calculating the differences, the retail (with VAT) price has fallen by between 4% and 7%, with the average being 5%; the ex-VAT price (the one you would normally compare against the US price) has fallen by between 5% and 9%, averaging 7.4%.